With pressure mounting, we urge the Labour Party to formally support the repeal of the Housing and Planning Act 2016. Show your support by passing a resolution at your trade union, political or community organisation. Motion template below. 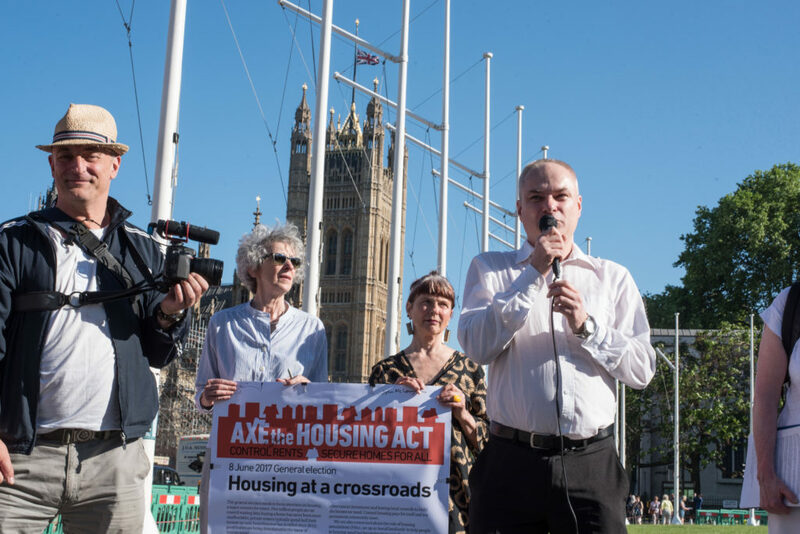 ” This [organisation] agrees the Housing and Planning Act (2016) and the subsequent Housing White Paper is a grave threat to all social housing and will greatly worsen the present serious housing crisis. The terrible Grenfell fire and the failed response of local and national Government, is now exposing the lethal mix of cuts, neglect and refusal to listen to residents, across Britain. 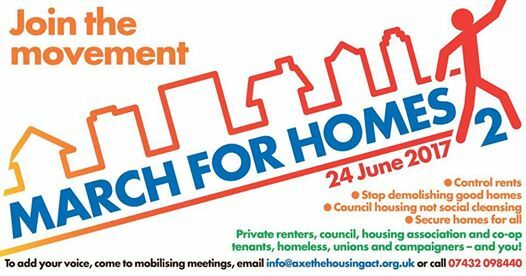 In hundreds of meetings, people are attempting to hold landlords to account and force them to act. Several councils have committed to fit sprinklers in all tower blocks: these include Birmingham, Sheffield, Croydon, Southampton. 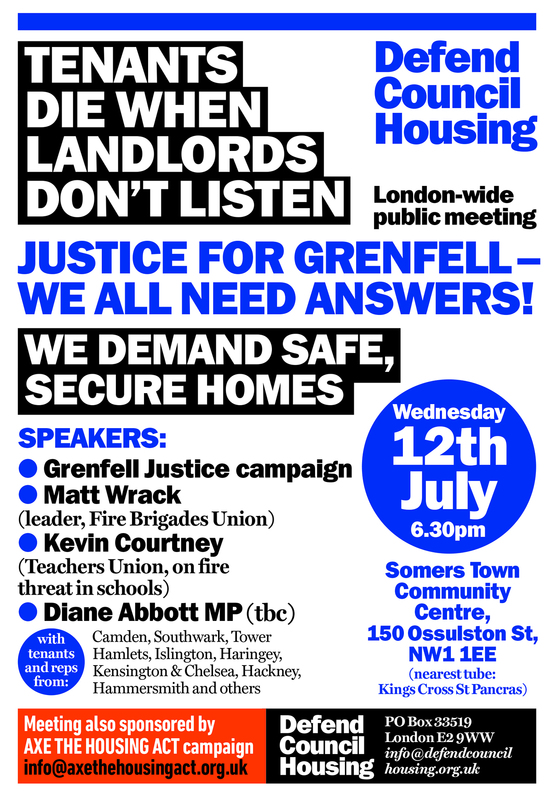 We are co-sponsoring a London-wide meeting on Grenfell and fire safety, with Matt Wrack of Fire Brigades union, Kevin Courtney of Teachers union, tenant groups and campaigners. This meeting will be held on July 12th, 6.30 pm at the Somers Town Community Centre, 150 Ossulston Street, London NW1 1EE. 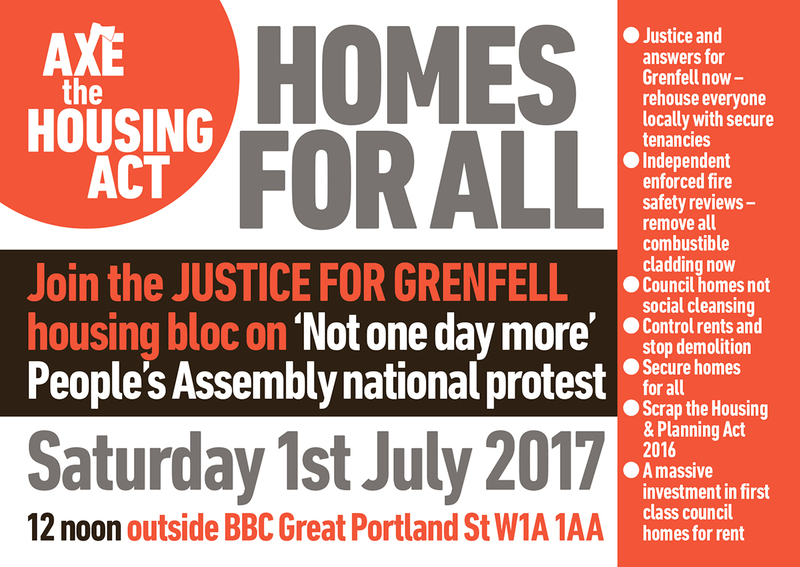 Please invite local residents and others concerned to secure justice for Grenfell and safety in our homes, schools and hospitals. Millions voted for change on June the 8th, including a new approach to housing. 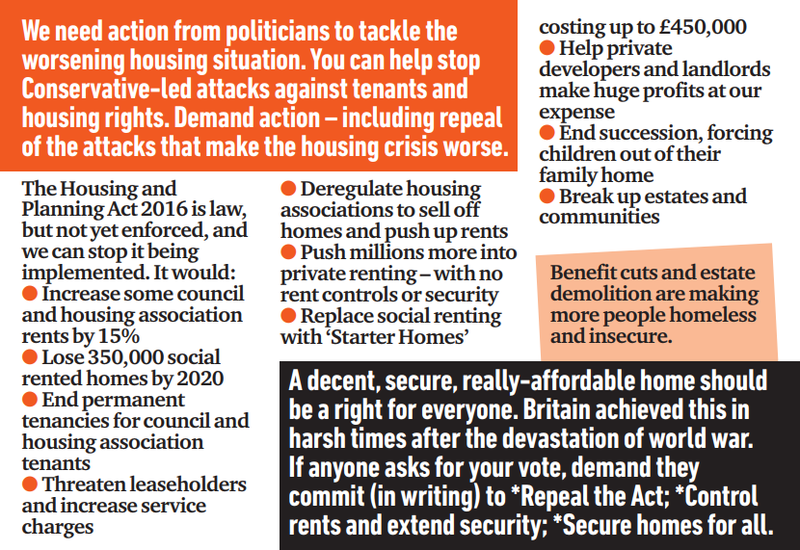 With the government and its Housing and Planning Act now in paralysis, we push forward with our demand for decent, secure homes and rent control for all. 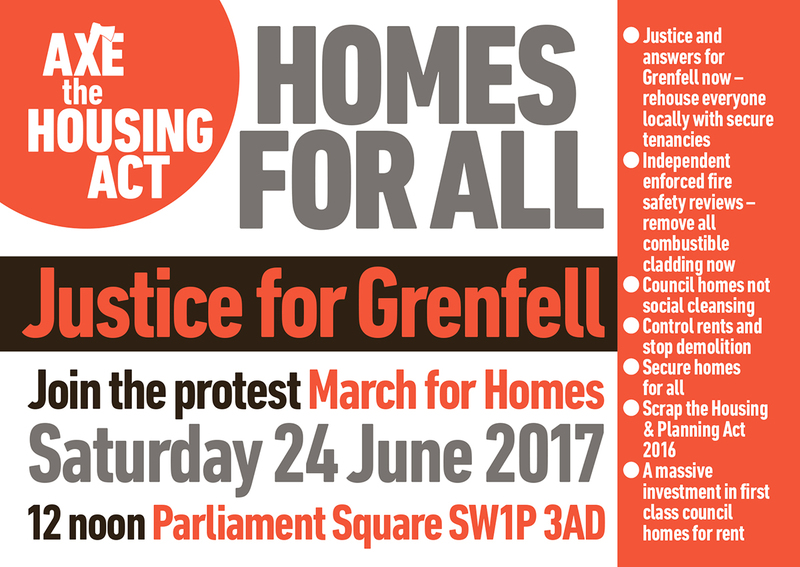 The terrible Grenfell fire is exposing criminal failures and neglect, savage cuts to public services and the refusal of this and many landlords, to listen to tenants. At least 17 people have died in the fire at Grenfell Tower. They deserve justice. We demand answers. Tenants die when landlords don’t listen. 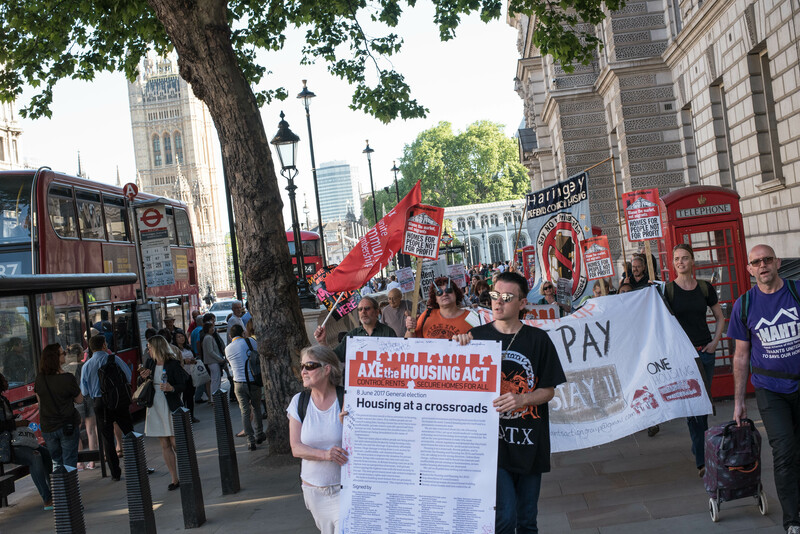 A ‘Vote for Homes’ protest marched to Downing Street today. 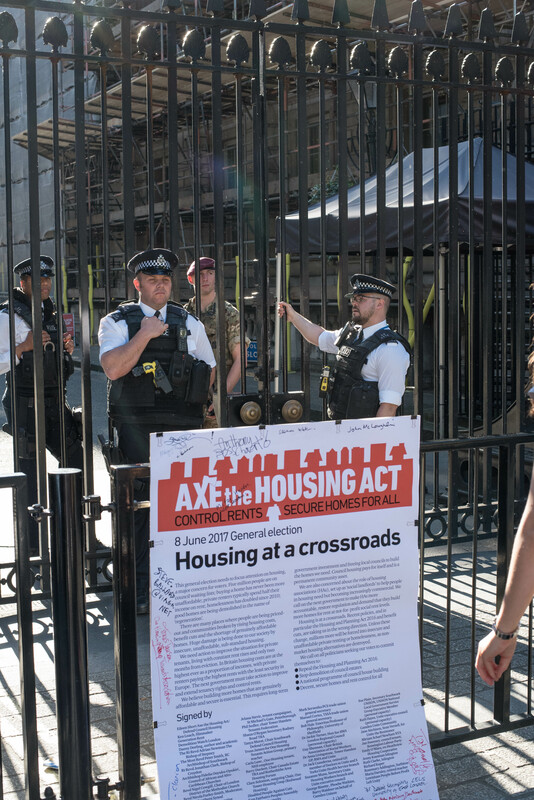 The noisy protest put housing as a central issue in the coming election. 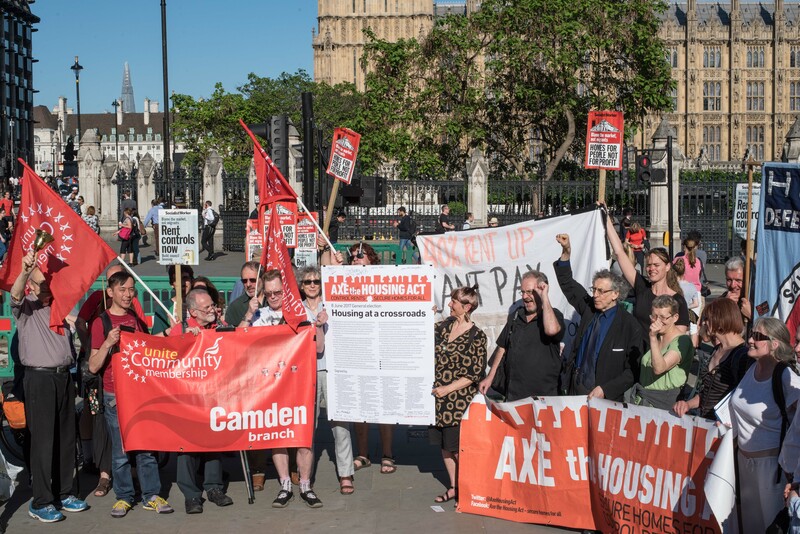 Council, housing association and private renter tenants, trade unions, homeless and community campaigns, joined to demand action to control rents, build council homes and scrap the Housing and Planning Act 2016, which threatens existing and future tenant rights and homes. 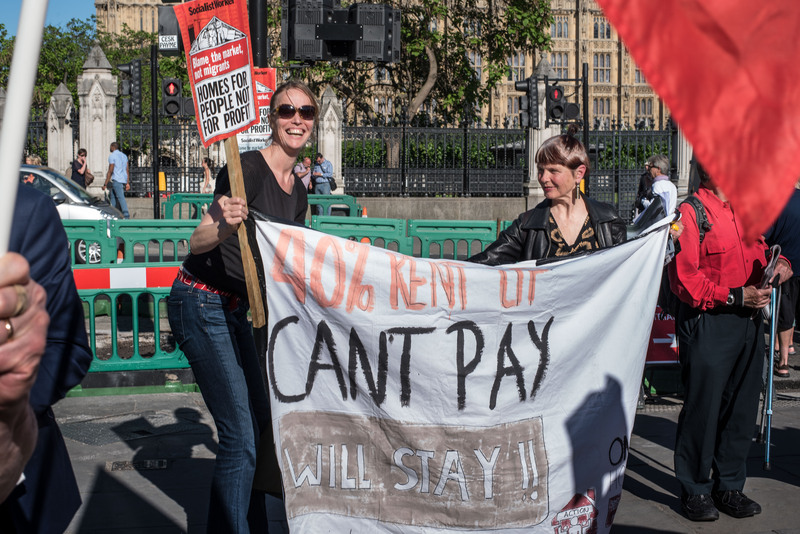 A letter signed by film maker Ken Loach, academic and author Danny Dorling, the Bishops of Stepney, Southwark, Croydon and others, Generation Rent, Demolition Watch London, plus trade unions and many others, was symbolically delivered to 10 Downing Street. All Photographs by Debbie Humphry. 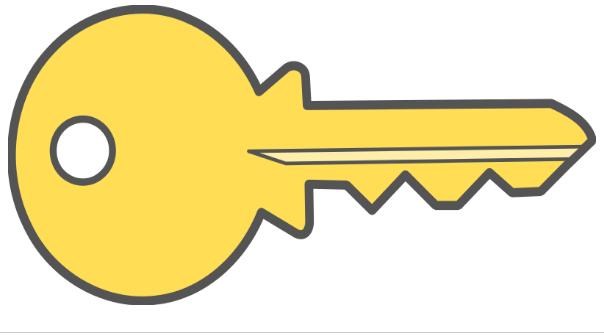 Come along with banners, friends, neighbours and workmates – and bring keys (real or cardboard) with your housing message attached. We will deliver them to Housing and Benefits ministers! 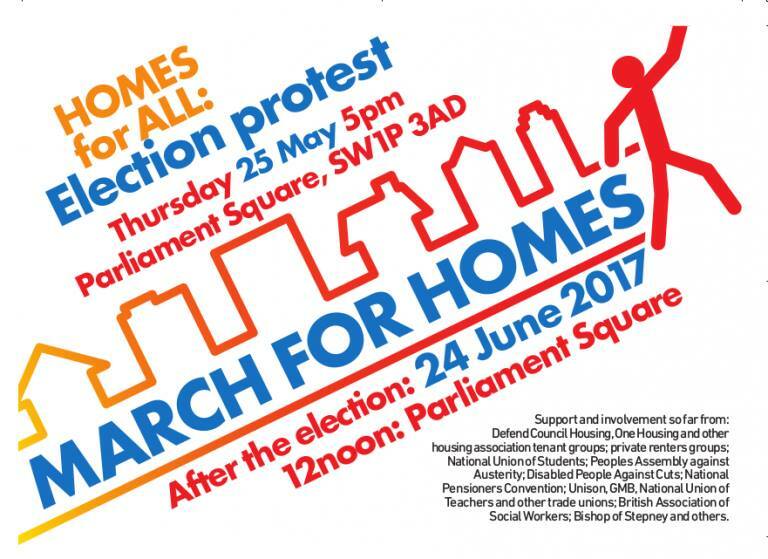 Join us at our Election Protest in London on 25th May 2017 at Parliament Square, London SW1. 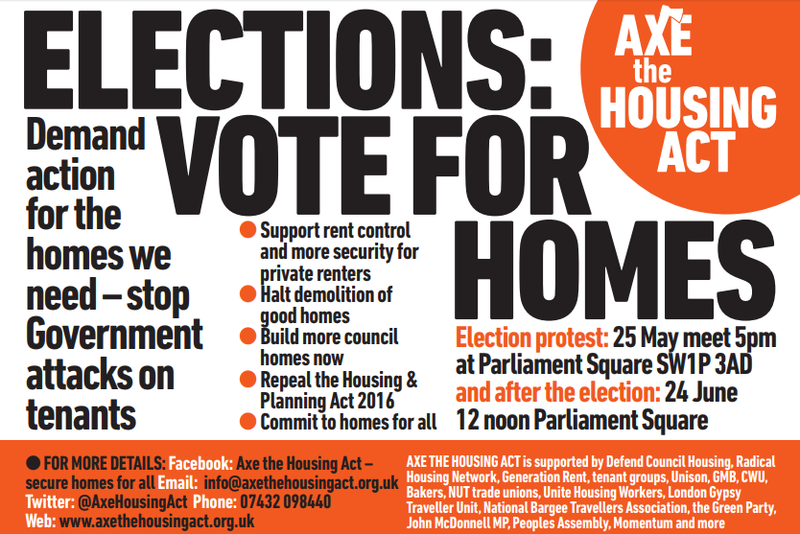 In this upcoming general election we must demand housing be at the forefront of all political agendas. 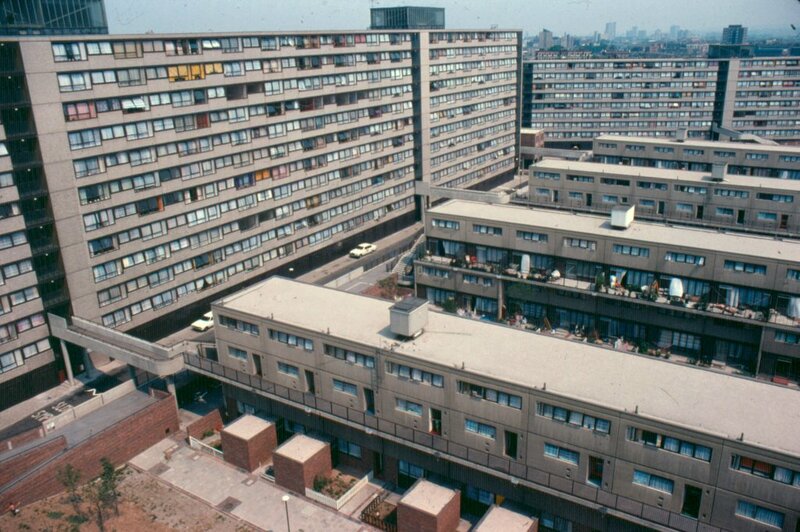 Tenants and housing campaigners will protest this Wednesday 19th April 5.30-6.30pm at the estate, now called ‘Elephant Park’; meet at junction of Heygate Street with Walworth Road. 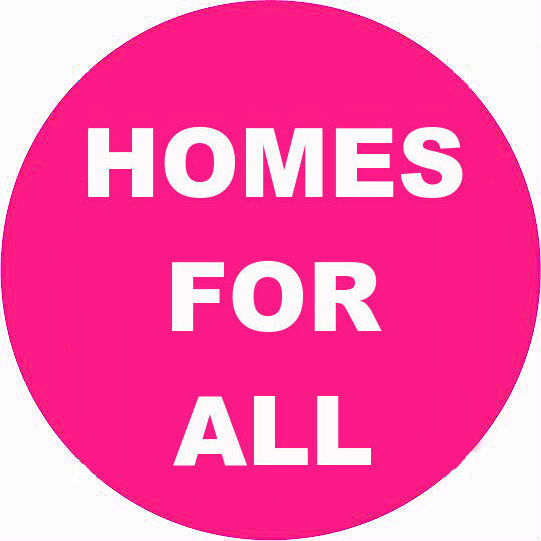 We want homes local people can afford, built for people not investors (wherever the money comes from). 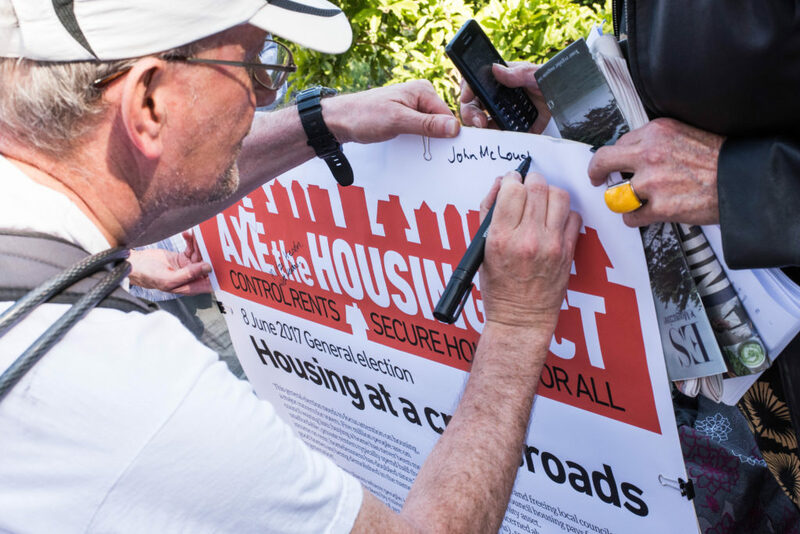 Axe the Housing Act – secure homes for all.